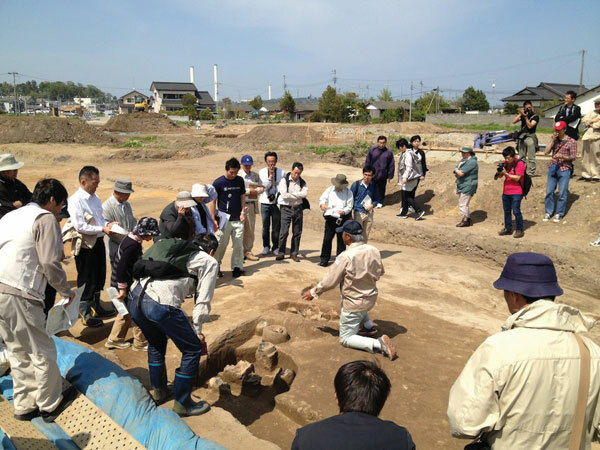 Excavations at the Sakuraba IV site, Hirono-cho Fukushima Prefecture, in advance of building new homes for people displaced by the 2011 disaster, revealed traces of 8th-century buildings. One of the biggest stories of the past decade continues to be our enhanced understanding of one of the greatest technological developments of the ancient world: the invention of pottery (CWA 11 & 38). Calibrated AMS dating on carbonised remains on sherds from Odai Yamamoto, AomoriPrefecture, by a team led by Taniguchi Yasuhiro, has re-invigorated the debate: ceramic container technology is now recognised as appearing over 10,000 years ago in several areas of East Asia. Archaeology is also helping us appreciate how people dealt with major environmental change during the Pleistocene/Holocene transition – clearly relevant to today as we face the implications of major climate change. And the emergence of ‘disaster archaeology’ in the wake of the 2011 Great Eastern Japan Disaster demonstrates the resilience of communities in the face of natural (and human-made) catastrophe (CWA 49). As I write, archaeologists with Geiger counters are involved in excavations prior to redevelopment in areas devastated by earthquake, tsunami, and nuclear meltdown; while, at the other end of Japan in the small town of Hirado, evaluation trenches are being dug to locate the mortal remains of the first Englishman to arrive in Japan: Will Adams, known in Japanese as Miura Anjin. What of the future? I am interested to see what impact the proposed inscription of 19 of the best Jōmon sites in northern Japan as UNESCO World Heritage will have on the profile of this fascinating period of creative and precocious activity that pre-dated the appearance of agriculture in the archipelago by millennia. Another UNESCO bid is for the monumental tombs of the middle 1st millennium in Osaka. But, whatever happens, I am sure that CWA will continue to be at the forefront of reporting developments in Japanese archaeology.